De noordkust van Spanje en het zuidelijke deel van de Golf van Biskaje. Van de Gironde in het zuiden van Frankrijk tot aan La Coruña in het noordwesten van Spanje. South Biscay is the complete reference for yachts visiting the flat sandy coasts of southwest France and the long Biscay coast of Spain. 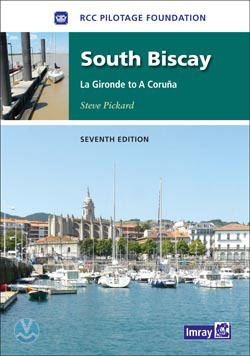 This seventh edition of the RCC's South Biscay pilot covers the coasts of France and Spain from the Gironde to La Coruna in Galicia. This edition has been completely revised and updated. In line with other recent RCC editions, waypoints have been introduced to assist navigation. With new photographs by the author and up-to-date aerials by Patrick Roach.